Flooded Greetland Cricket Club ground. 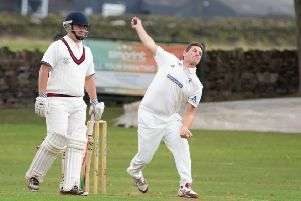 Halifax Cricket League officials have pledged to do all they can to help struggling Greetland CC from going to the wall. The West Vale-based club, a founder member of the league in 1914 and champions on 13 occasions, was unable to raise a second team to play at home to Luddenden Foot last Saturday. The club is determined to avoid becoming another of the original members to fold after the resignation of Stainland CC in recent times. They have appealed for players to help them out, having already won one battle this spring in getting their ground fit for play again after the Boxing Day floods. A statement from the Spenser Wilson Halifax League said Greetland CC was determined to see the emergence of a strong community club once more and members were working with the Halifax League executive to remedy their situation. Playing and social facilities at the Saddleworth Road ground are said to be excellent with further improvements planned. “The club believes that its present problems mirror those faced by amateur cricket leagues around the county, many of who are experiencing difficulty in producing two or three open age teams,” said the statement. Anyone interested in joining the club should contact Andy Cleveland at acleveland@hotmail.co.uk on 01484 386146 or 07853311242 or Les Forester on 01422 379980 or 07845184138.